Spring has finally sprung! Can you find the sun? We had very dreary week here in MA. last week, but I am a happy to say that the sun HAS come out again! It’s hard not to acknowledge the analogy to life here and that hopefully the sun does come out again from whatever clouds are on top of you at any given time. As for me, the endless days of grey really seemed to affect my psyche, and it appeared to me that was true for many people/friends I spoke with as well. The good news is the sun is out again, showing its sunny bright self for a few days now. 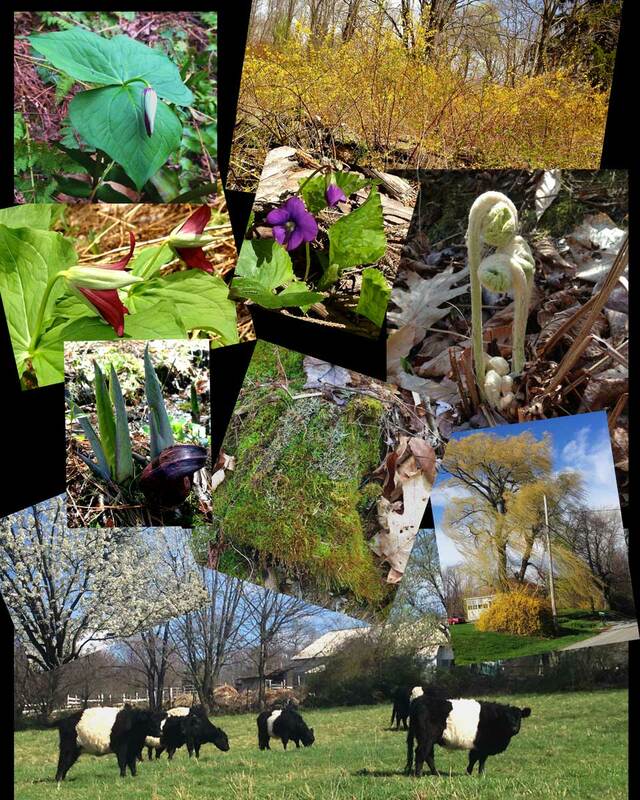 To honor the sun, and the (finally) arrival of spring, todays post shall be a photo collage I am calling Hurrah it’s Spring! The photos are all from todays sunny Sunday wonderful dog walk with a wonderful friend – whom I want to give a shout out to for all the friendship and support we pass back and forth, don’t know what I would do without you! For that matter while I thinking about it, it’s a good time to thanks ALL my wonderful friends and family for all everyone does. There are pieces of me that would be lost without each one of you. Spring seems to be a good time to give a nod to all those we treasure. Something about buds bursting, shoots popping up, colors reappearing, streams flowing again, and that ever so luscious feel of sun on my skin after a long winter. I hope everyone has a moment or two to notice the sun, the blossoms, the flowers, the glorious colors, dancing yellow Willow trees, and I couldn’t resist adding the cows. I will call them The Cummerbund Cows, who appear to be enjoying the spring grass! We can all enjoy and rejoice in the beauty of nature and springtime …and…. THANK GOODNESS FOR THE SUN AGAIN! Some of the wonders of Spring! Previous Previous post: Potential, the number 4 – and the connection to Earth Day is? Next Next post: To all Mothers!